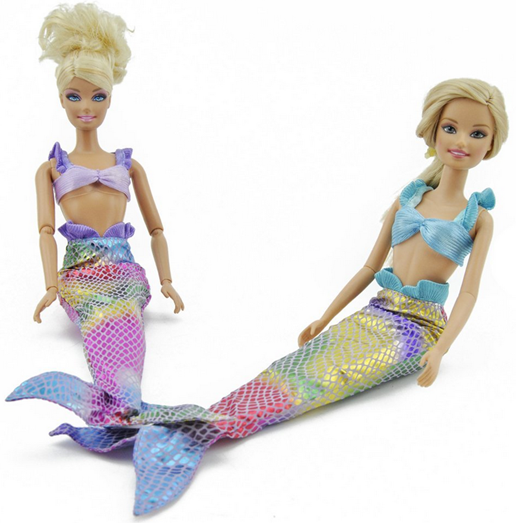 2 Barbie Mermaid Outfits Just $4.59 PLUS FREE Shipping! You are here: Home / Great Deals / Amazon Deals / 2 Barbie Mermaid Outfits Just $4.59 PLUS FREE Shipping! You can get 2 Barbie Mermaid outfits for just $4.59 PLUS FREE shipping! I LOVED Barbie when I was a kid – I had a ton of them! I remember one year all the Moms in the neighborhood got together and made a ton of Barbie clothes for all the girls in the neighborhood for Christmas – I was so excited!